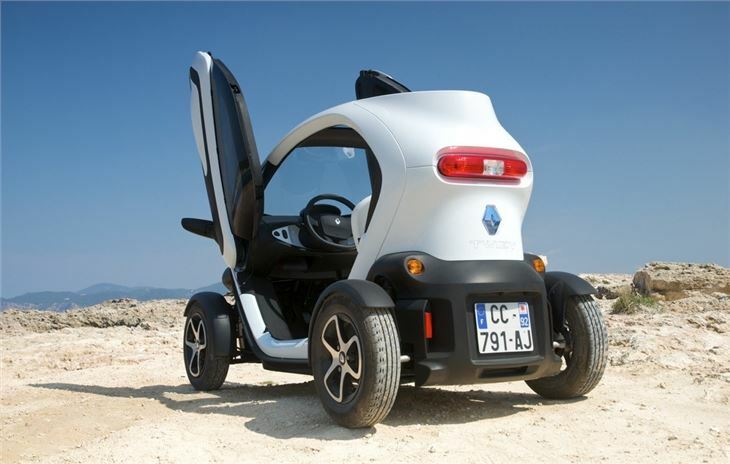 You have to treat it like a motorbike in some respects though. 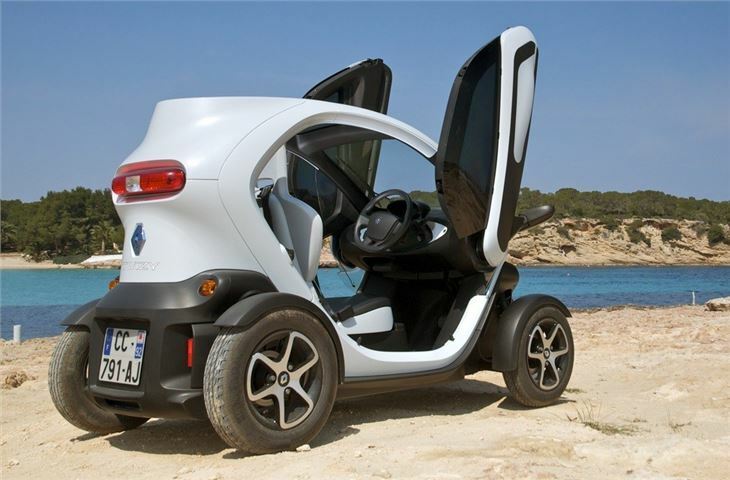 It doesn't come with any doors (they are a £545 optional extra) and even with them there are no side windows, so you're always open to the elements. In wet weather, suitable clothing is essential. 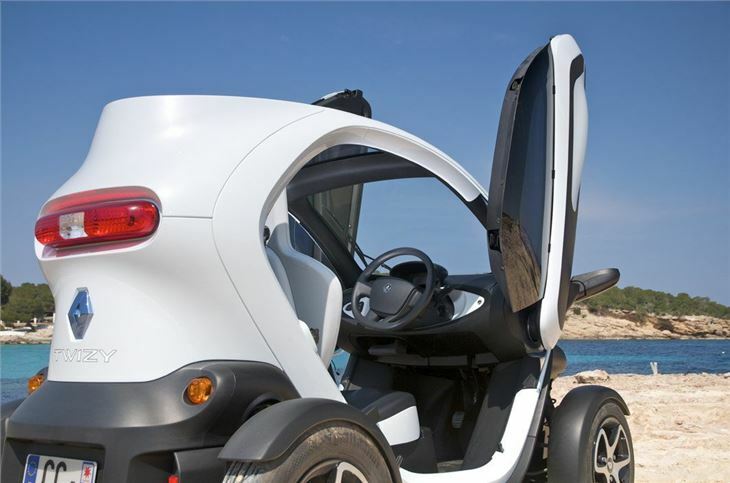 The gullwing doors open upwards which adds to the funky feel of the Twizy, plus it also makes getting out in tight spaces easy. 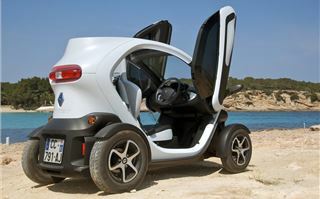 You can't 'lock' the Twizy either so it's best not to leave anything valuable on show. 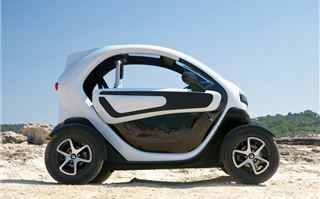 Although there is a lockable cubby on the dash top and a larger one behind the back seat. Inside it's best described as 'basic'. 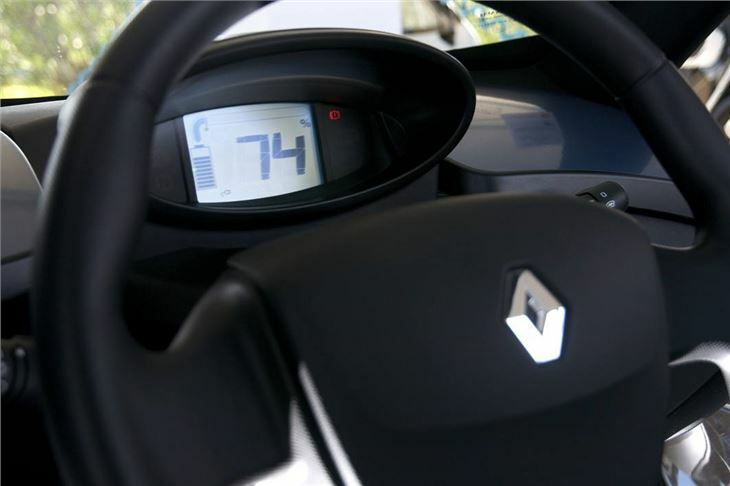 There's a steering wheel and a digital speedo with a trip computer but not much else. No heater or stereo, although a Parrot Bluetooth hands free system is available as an option and lets you stream music with speakers integrated into the roof. 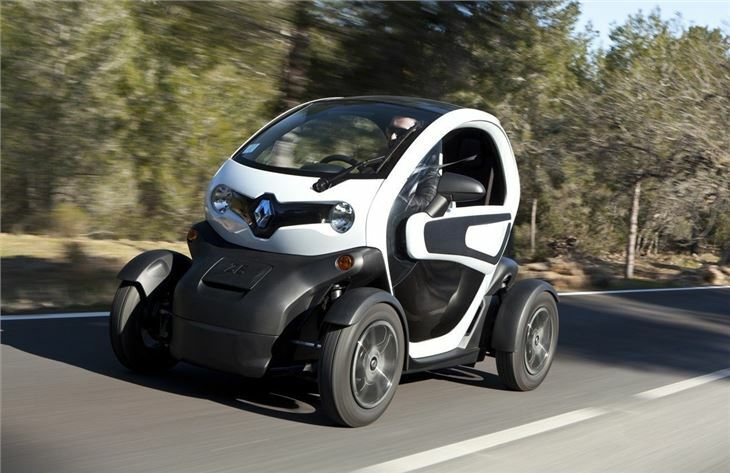 Renault describes the Twizy as 'out of the ordinary' and it's certainly that. It looks like something from of a sci-fi film or a theme park. You could easily imagine it zooming around the Olympic village this summer. Complete with its odd cyclops light at the back. It really is a diddy little thing at less than 2.5 metres long and 1.5 metres wide while it weighs around 475kg. A Range Rover weighs six times as much and is double in length. Those small dimensions mean you can park the Twizy nose on to the pavement (like a Smart) and with a tiny turning circle it fits into the smallest of small spaces. 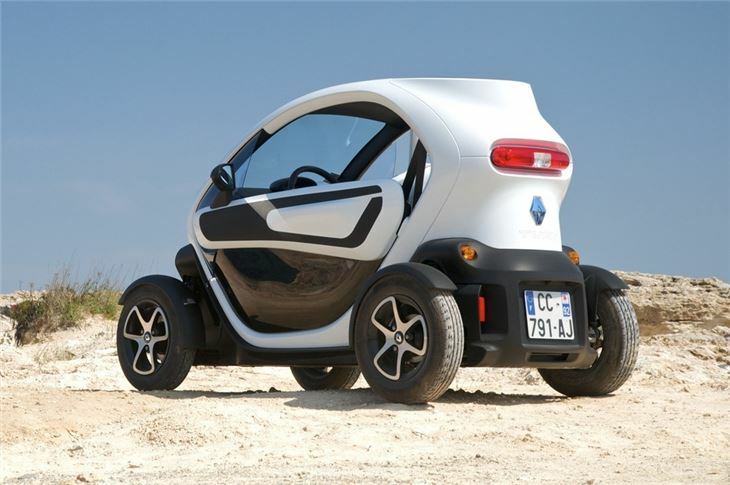 As you'll have guessed it's designed for urban commuting, so rather than a petrol engine the Twizy has an electric motor powered by a lithium ion battery. This means no engine noise, no CO2 emissions, no annual road tax and no charge for going into the central London congestion charge zone. 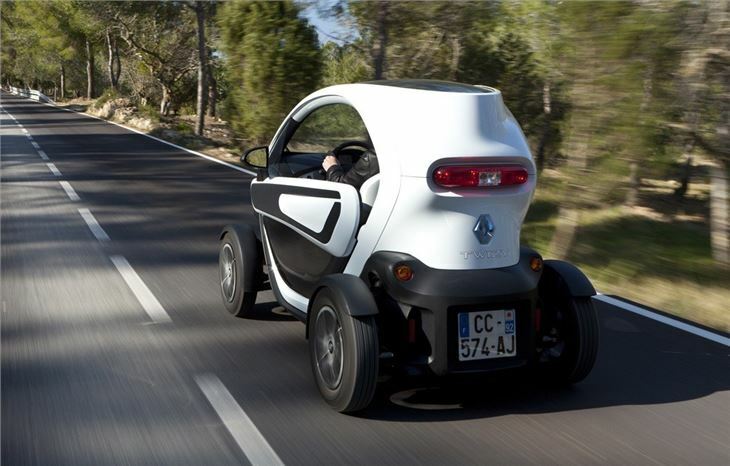 The system produces 17PS which doesn't sound much but with 57Nm of torque available from a standstill, the Twizy is actually nippy over the first 50 metres with similar performance to a 125cc scooter, so it's ideal for busy cities. There's enough get up and go once you're up to speed too. It's also simple to drive. 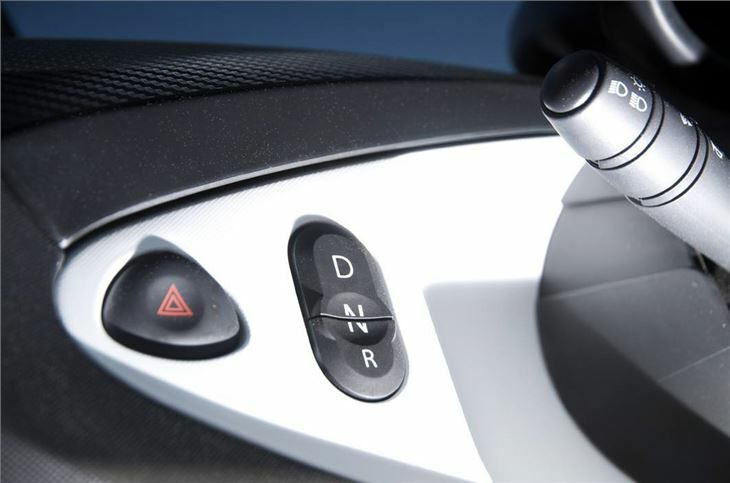 You turn the key, push the D button on the dash, release the handbrake and off you go. 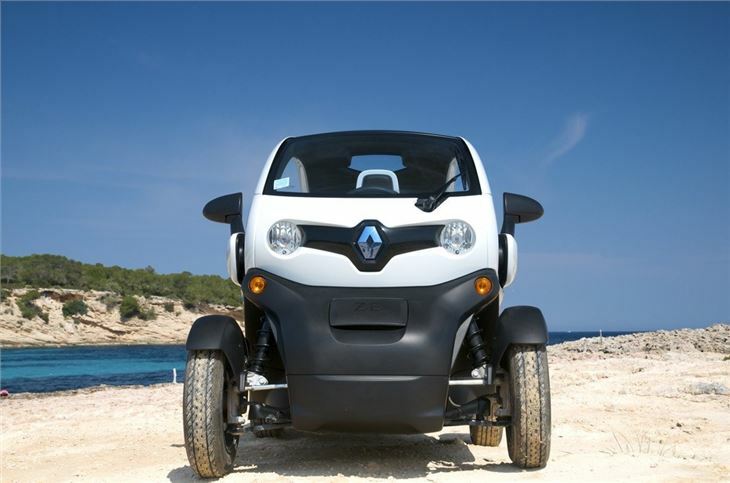 There's just one gear so you always have power available and the steering is nice and responsive so it's easy to nip round tight corners. 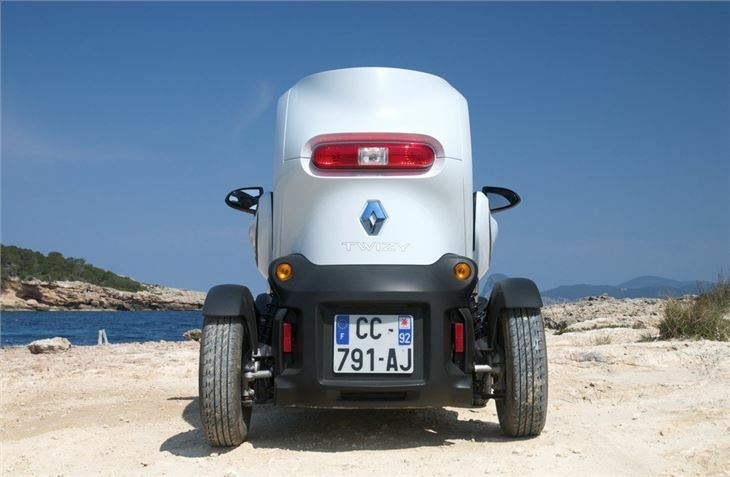 You actually sit right on top of the battery - the single heaviest part of the car - which means a low centre of gravity and good stability. 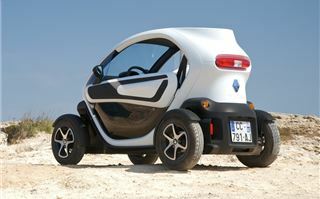 Even at its top speed of 53mph, which feels very fast in such a small vehicle, the Twizy is stable and reassuring. The big problem can come from other road users. Some drivers don't see it as a bona fide car and will simply drive around you, even if you're at the speed limit. Others don't realise how fast it is and will simply pull out in front of you on main roads. Despite that it is still great fun to drive and every journey feels like an event. 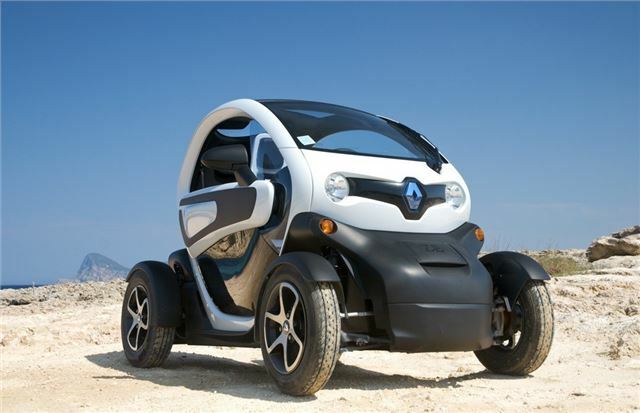 It really is unlike anything else and attracts huge amounts of attention thanks to its futuristic design. 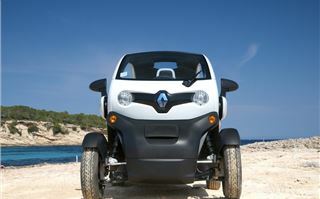 Of course that's easy to say having driven it around Ibiza on a nice warm spring day. Whether it will still seem appealing on a wet and cold February morning in the UK is another matter. It certainly makes you hyper aware of other vehicles. Sitting in traffic with buses and trucks, you suddenly feel very vulnerable. That said, while it is open to the elements, it's not at all blustery on the move. In fact even at top speed there's only a gentle breeze. 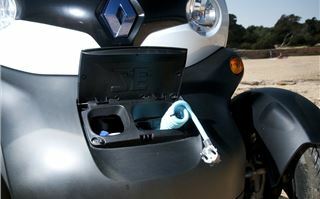 Charging the battery is simple. 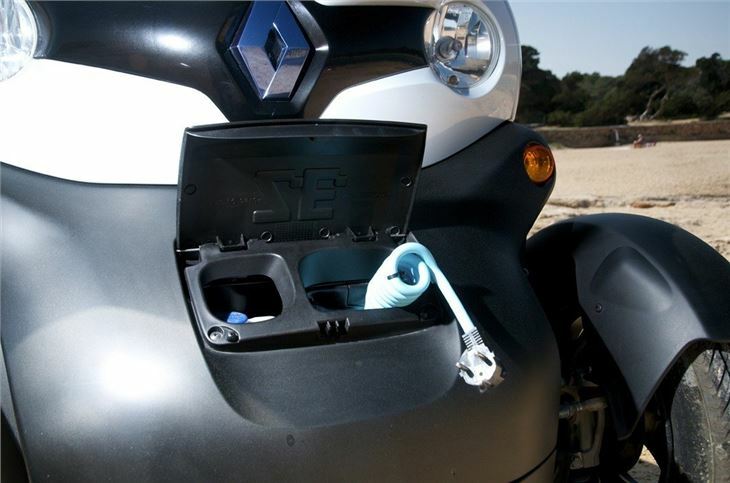 There's a flap on the front of the car and inside a three metre cable with a standard three-pin plug on so you can charge it from a normal household socket. A full charge only takes three and half hours and costs around £1. 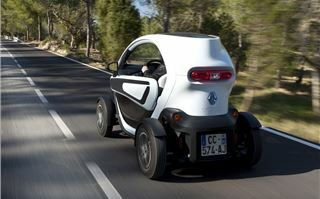 And when at 100% the Twizy has an official range of around 62 miles, although in everyday driving you're looking more at 50 miles. The one main concern for buyers will be safety and it's something Renault is keen to highlight. 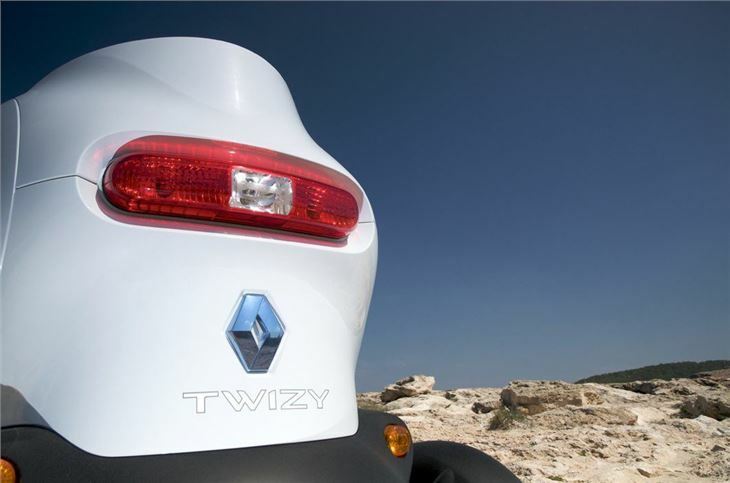 Like the electric motor, the main structure of the Twizy was developed by Renault Sport, with influence from F1 technology, so it's light and strong. 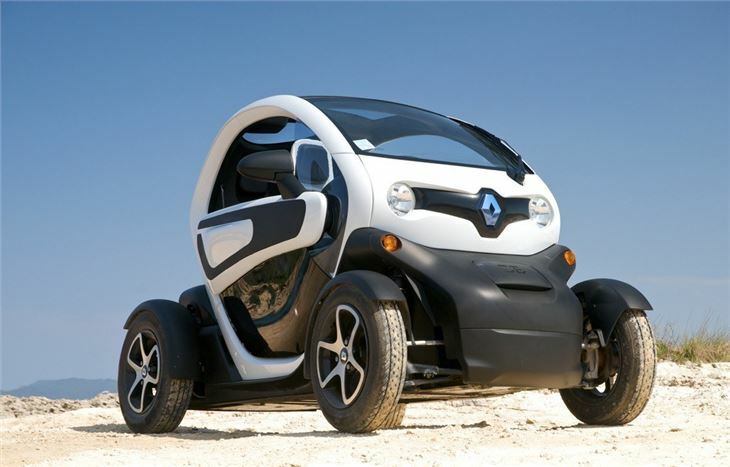 There's a driver's airbag, seatbelts for both people and disc brakes on all four wheels. It will no doubt prove popular in its home market - and not just because it's a Renault. 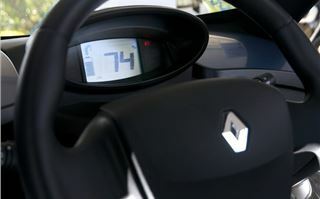 In France, if you are banned for drinking driving, you can still drive a vehicle that's limited to 45km/h. 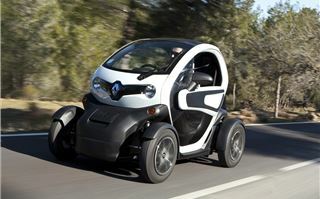 Which is why Renault has the Twizy 45, a lower powered 5PS version which, as its name suggests, has a limited top speed. 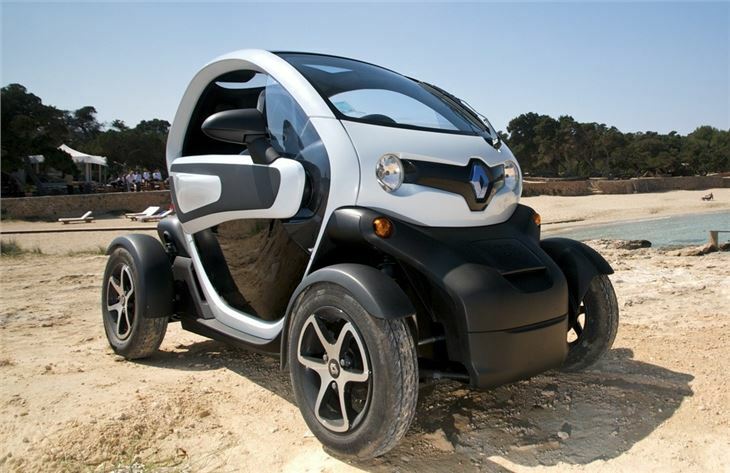 There are no plans to bring this to the UK but there have been recent changes to UK driving licence categories that could alter that. So who's going to buy one in the meantime? Well the obvious customer would be someone living in a busy city who wants a dedicated vehicle for a short commute to work. Or maybe even university students. 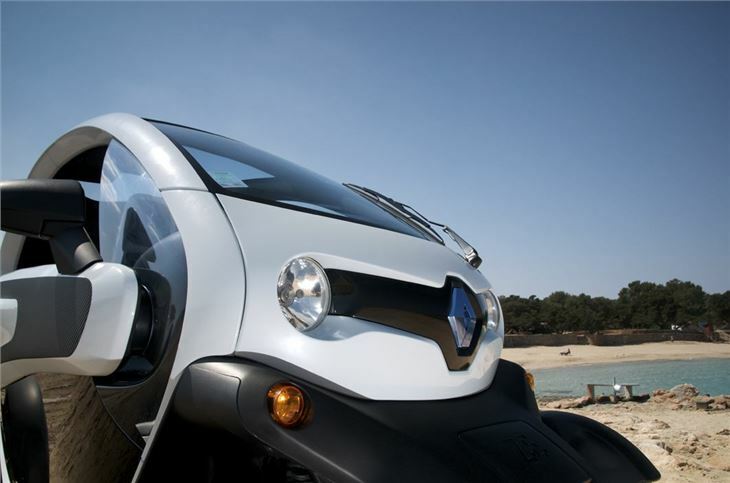 It's safer and more comfortable than a scooter but then you can't nip in and out of stationary traffic. Plus you can't park in motorbike bays or drive down bus lanes either.